We are currently seeking Distributors. Please call for more info. California Concept announces its Ultra Rich Skin Recovery Cream for Post-Treatment Healing! 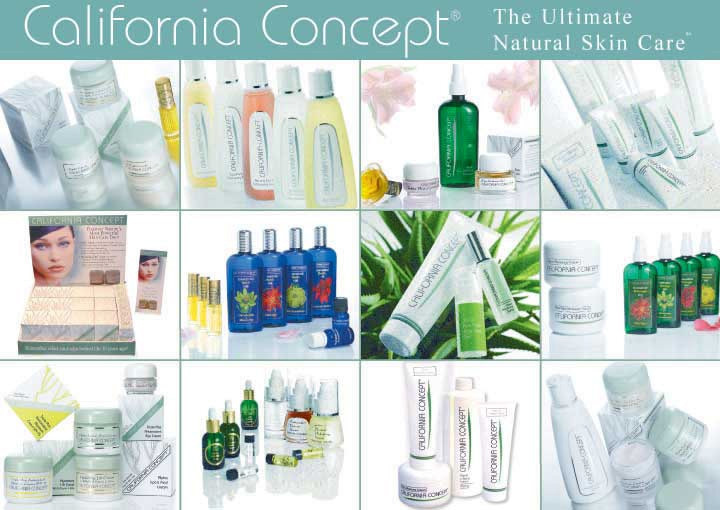 California Concept Skin Care announces the newest addition to our natural skin care line with our Skin Recovery ADE +C. A rich, healing cream containing 2% Panthenol and 2% Vitamin E plus Antioxidants A,D & C along with their signature ingredient pure Aloe Vera. Vitamin E is the major naturally occurring lipid-soluble antioxidant protecting skin from the adverse effects of oxidized stress including photoaging (sun damage).Topically applied Panthenol and Aloe Vera have been reported to speed wound healing by 50%. This rich moisturizer is a protective vitamin complex cream. The natural jojoba and macadamia nut oils enhance the richness of the formula. No color added. The perfect extra rich, healing formula for dehydrated, irritated or environmentally-stressed skin! This is the one that'll keep you looking great for years to come. It uses NO chemical sunscreens and it's Paraben free!! 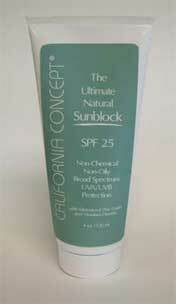 Protect your skin from UVA/UVB broad spectrum radiation with California Concept’sUltimate Natural Sunblock SPF 25 containing micronized zinc oxide and titanium dioxide. This light formula is non-oily and leaves skin feeling clean and soft. This gentle formula is excellent for all skin types, even for oily or sensitive skin and is paraben free! Zinc oxide and titanium dioxide are physical sunblock ingredients that form a protective barrier over the skin, stopping UV rays from penetrating the skin’s surface. Titanium dioxide protects in the UV range from 290-340 nm and protects fully against UVB radiation. It fully protects against UVB radiation but only protects against the short UVA radiation 320-340 nm. Zinc oxide covers from 290-380 nm and therefore protects against UVB 290-320nm and most of the UVA 320-400nm. Contains no chemical sunscreen ingredients. 99.7% Pure Aloe Vera "The Natural Healer" from organically grown aloe vera plants. Inner leaf gel, no fillers, not dried or processed, maximum enzyme effectiveness. A premium, professional grade product! A soothing, healing and moisturizing spray for all skin types, the formula includes 5% Panthenol (Pro Vitamin B), Aloe Vera Juice, Chamomile & Plant extracts. An excellent post-treatment spray that moisturizes and speeds healing. A soothing, anti-irritating, healing gel masque with a high percentage of Aloe Vera Gel plus Panthenol and plant extracts. Moisturize, Repair and Protect the delicate skin around your eyes with this rich moisturizing formula fortified with powerful antioxidants. Prevent free radical damage that causes lines and wrinkles. Contains aloe vera gel, jojoba oil, green tea extract, licorice extract, grape skin extract with resveratrol, Vitamins A,C,E, alpha lipoic acid. This cream is also excellent for moisturizing and protecting lips. No artificial color or fragrance added. The unique purple color occurs naturally from the grape skin extract. Ingredients: Aloe Vera Gel with full water (aqua) content, Glycerine, Caprylic/Capric Triglycerides, Stearic Acid, Cetyl Alcohol, Glyceryl Stearate SE, Jojoba Oil, Allantoin, Panthenol, Witch Hazel Extract, Green Tea Extract, Licorice Extract, Grape Skin Extract, Tocopheryl Acetate/Vitamin E/ Retinyl Palmitate/Vitamin A/ Ascorbyl Palmitate, Alpha Lipoic Acid, Collagen, Methylparaben, Ethylparaben, Imidazolidinyl Urea. No color or fragrance added. This is an effective antioxidant, anti-aging and anti-inflammatory daily skin cream. Alpha Lipoic Acid is one of nature's most advanced, powerful and effective antioxidant and anti-inflammatory substances. With 100% pure, fresh Aloe Vera, Green Tea Extract, Vitamins A& E, our Alpha Lipoic Acid Cream works hard to improve the overall appearance of your skin to make it more vibrant. It may be especially effective in reducing fine lines and wrinkles, treating enlarged pores, bringing a healthy glow to dull, pallid skin and reducing the appearance of under-eye bags/puffiness and blemish scars. Alpha Lipoic Acid is a super antioxidant, it is water- and fat-soluble and can penetrate any part of the cell that needs protection. It plays a special role in quelling inflammation, the condition that precedes lines and wrinkles. Alpha Lipoic Acid is not an Alpha Hydroxy Acid! Green Tea Extract is loaded with polyphenols which have antioxidant and anti-inflammatory properties and have been shown to increase the body's resistance to cancer. Vitamin A in the form of Retinyl Palmitate is a good choice for visibly damaged skin because it has shown to increase collagen and reverse sun damage. Vitamin E in the form of Tocopheryl Acetate is known to reduce inflammation and promote wound healing. Finally, our primary ingredient is Aloe Vera Gel/Aloe Barbadensis Miller from the inner gel of the leaf. The application of Aloe Gel to the skin accelerates fibroblasts. Fibroblasts are found in the dermis of the skin and are responsible for the fabrication of collagen. 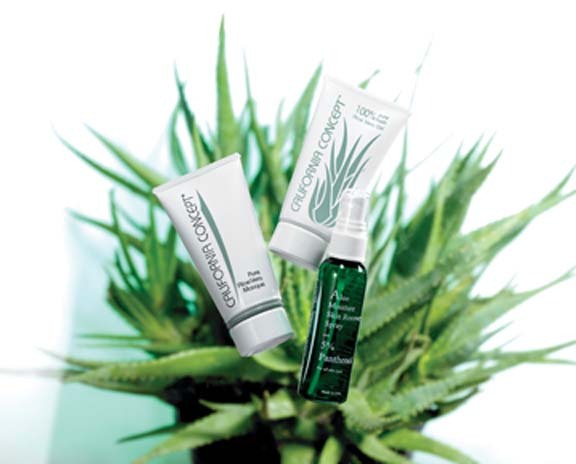 Skin absorbs moisture from Aloe Gel three to four times faster than water. An intensive skin treatment that lifts, firms and hydrates the skin. DMAE lifts and firms, Green Tea Extract and Ascorbyl Palmitate/Vitamin C ester aid in reversing sun damage, Beta Glucan has anti-aging, healing and cell renewal properties. These powerful ingredients are in a base of Aloe Vera Gel known for healing and stimulating collagen production. Powerful antioxidants, vitamins A/Retinyl Palmitate/, C/Ascorbyl Palmitate/, E/Tocopheryl Acetate/, protect skin from free radical damage to prevent premature aging and wrinkling. Jojoba oil, collagen and elastin also add hydration without clogging pores. This luxurious treatment is for normal to dry skin. No color or fragrance added.